You’re on the right page if you know you need to start an email list, and you want to get it done the right way—and fast. 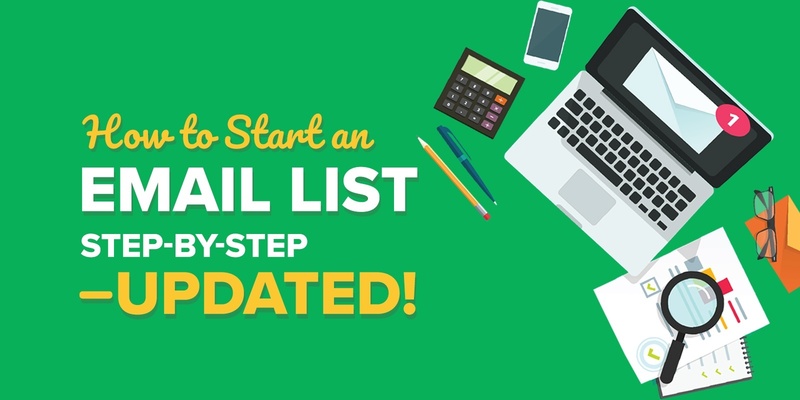 After this step-by-step tutorial, you’ll have an email list up and running, an autoresponder sequence laid out and ready to go, and even learn some more advanced stuff that’ll help you stand out from your competitors, too. Looking back at the first business I created back in 2008, not having an email list was like shooting myself in the foot. It was a huge mistake, because I sold products, but had no way of letting people—interested people —know that they existed. Even here, on Smart Passive Income, I didn’t collect my first email address until 1.5 years after I started the blog. Big mistake—and I made it twice! That’s exactly what I want to help you with in this tutorial, because you need an email list so that you can grow your business, or even start one if you’re right at the beginning stages of your online business journey. Keep reading, and then get ready to take some notes, and take some action, too! I’ve grown my email list to 200,000+ email addresses. Email has helped me discover the top pains and problems of my audience, which can then be used to craft content and product ideas to help alleviate those pains and problems. A single broadcast email once helped me earn over $60k in affiliate earnings. More than $1,000,000 in total earnings can be directly attributed to my email list. Email lists have proven to be versatile for driving new traffic to SPI by promoting new posts, and also resurfacing older posts. They also let me send out notifications when I add new information to an older post. Automated follow-up sequences have allowed me to serve my audience with additional content that allows me to keep in contact with people over time so that I end up with higher open and click through rates. My email segments let me send updates directly to the people on my list I know will be interested in a particular product or post, and skip notifying people who I know aren’t ready for it yet. In March 2013 I was in San Francisco shooting promotional video for my book, Let Go, when hackers took my website down—for an entire week. I couldn’t log in to the site. Everyone who came to the site got an error screen, and the only way I could communicate with my audience was through my email list. The email list I had built literally saved my business for a week. I was able to keep my audience up to date, I shared podcast episodes and YouTube videos that were coming, and kept my business up and running even though my blog was completely out of commission. Your email list is a huge asset and the experience of not being able to use my main communication tool—my blog—hammered home the benefits of having a solid email list. Don’t Forget: It’s Not About the Money. Thanks for reading through this, because seriously—most people miss this stuff and it’s so important for your long-term success in email marketing. So many people in the online business space will tell you that “The money is in the list.” While that’s not entirely untrue, I happen to think that it’s just a small (but still important) part of the picture. You see, I believe that the money is in the list because that’s where the people are. That may seem obvious, but let’s break it down a little bit more. When you create an email list, you’re allowing a group of fellow human beings to come together in one place where they expect to hear from you. You have a huge opportunity—responsibility, even—to provide value to them. When someone essentially says, “Hey, I like you enough to give you my email address,” you owe it to them to offer up everything you can to ensure that they make progress, stay informed, or are entertained. It’s not all about money and it’s not all about the numbers, either. I have so many people reach out and tell me that they feel discouraged with their small email lists. But, since we’ve already established that these are actual human beings, I like to take a much more visual approach. When you think about the 50 or 100 people on your list, think about having that many people in a single room to hear you speak. They’ve all shown up to hear whatever it is you have to say. And, if generating an income is one of your goals, you’re likely to do very well. Here’s the thing: don’t send bulk business emails to your list through your free email service. Not only will you be breaking email marketing opt-in laws, you’ll also have no real way to grow your list. Also, they’re offering a 30-day free trial if you get started today! You can use the strategies and tactics you learn in this tutorial with any ESP; however I’ve personally experimented with a lot of different ESPs over the years, and I recommend ConvertKit to you because it’s the one that has everything I need to grow my business, while still being very intuitive and easy to use. You can read more about my choice to switch over to ConvertKit (from two other providers) here in this post. The platform is well designed and extremely easy to use. The names of the tools are clear and easy to understand: forms, automations, sequences, broadcasts, subscribers. Emails are delivered reliably and as expected. Their customer service team is super helpful, and they have 24 hour online chat available (a feature my team uses often when we have questions). It comes with powerful tagging and segmentation features. Visual automations make it easy to create complex “if this, then that” rules. It’s extremely easy to make changes and updates. For example, if you decide to change a tag’s name, that name automatically updates everywhere you’re using the tag. Now, let’s get to the tutorial videos! These videos are a completely free resource for you, and they walk you through the process of setting up your list, step-by-step, right from the start. How to setup your list and place an opt-in form on your website. Advanced strategies people are using to scale the list building process. How to setup a winning autoresponder series. How to send broadcast emails that get opened and clicked. How to start segmenting and tagging your email list so you can learn even more about your subscribers. In this video, I’ll teach you how to make your visitors want to sign up for your email list. I will explore the biggest mistakes people make when starting email lists, eight types of incentives you can use to get people to sign up for your list, and ten specific places on your website you can place an opt-in form. I also mention 100 Emails, my new (and free!) email marketing challenge that will help you get from 0 to 100 email subscribers in 3 days. Interested in joining the challenge? Head to 100emails.com! In this video, I’ll teach you my favorite methods for bringing in new website visitors and getting them to sign up for my email list. I delve into ten specific strategies you can use (I’ve used them too!) to get more subscribers starting today. By this point you may be thinking, “Pat! I just want to send a regular email to my list!” Okay, let’s get to it! These are called broadcast emails, and in this video I’ll tell you how to use them effectively. I share how broadcast emails differ from autoresponder emails, and, most importantly, how to broadcast effectively to your list. I give you the basics of what segmentation is, how segmentation can be used, and how you can masterfully set up segmentation for your own email list. The first 1000 episodes of the AskPat Podcast featured lots of questions on email list building. I am featuring many of those questions here because I think they’re issues you’re likely to encounter as you work through the advice above. Promise me one thing: when you hit a question or a problem, you won’t let it stop you. Questions will come up. A great place to ask those questions is in the Smart Passive Income Community Facebook group. This closed Facebook group is made up of both new and established online entrepreneurs from the SPI audience. It’s welcoming and supportive—the perfect place to find help to keep you moving. Visit the show notes for AP: 0062. Visit the show notes for AP: 0073. AP 0128: Is It Worth Starting an Email List, Even Though I Don’t Have Many Visitors? Visit the show notes for AP: 0128. Visit the show notes for AP: 0463. Visit the show notes for AP: 0574. Visit the show notes for AP: 0608. AP 0651: What Content Do I Send to My Podcast’s Email List? Visit the show notes for AP: 0651. Visit the show notes for AP: 0684. Visit the show notes for AP: 0800. Visit the show notes for AP: 0880. I didn’t want you to make the same mistakes I made when I failed to start an email list early on in my entrepreneurial journey. So I wrote Email The Smart Way, my free ebook designed to make sure you never run out of email ideas for your audience. A playbook designed to help you write ten different styles of emails. Advice on when to send each email style and what the call to action should include. A strong understanding of the difference between broadcast and autoresponder emails, so that you send the right email at the right time. My rules for what makes for a good email. I want the energy of your business to thrive, and it’s why I recommend you read Email the Smart Way. It’s free! Read Email the Smart Way today. Thank you so much for reading this tutorial and watching the videos. I sincerely hope it has helped you to start and grow your own email list. You are why I am here. Without your support and passion, I wouldn’t be able to do what I do. So thank you for that! If this tutorial has helped you in some way, I’d love to hear about it. And, if you’d like to help me out, please share this tutorial so others can benefit too!